Torrential Rain became a feature of the last few days we spent in Hanoi. One morning we decided to brave it, carrying only our umbrella and wearing open shoes. THIS WAS A stupid idea. We made our way down the stairs of our hotel and turned left, we were undercover for 100metres before we really hit the big time. As we emerged clutching our umbrella to cross the street, the rain literally hit the pavement and then jumped back up to meet us. After several metres of this, dodging parked motorcycles and overhanging canopies, we were soaked. We returned to the hotel several minutes later, completely saturated and wondering when it would stop. The claps of thunder and flashes of lightning seemed to suggest that this was only the start. Unfortunately or luckily we were both a little under the weather and quite enjoyed the excuse to stay inside and savour the great air – con. But strangely enough, the weather cleared and the wet blanket air wrapped its’ arms around Hanoi again. 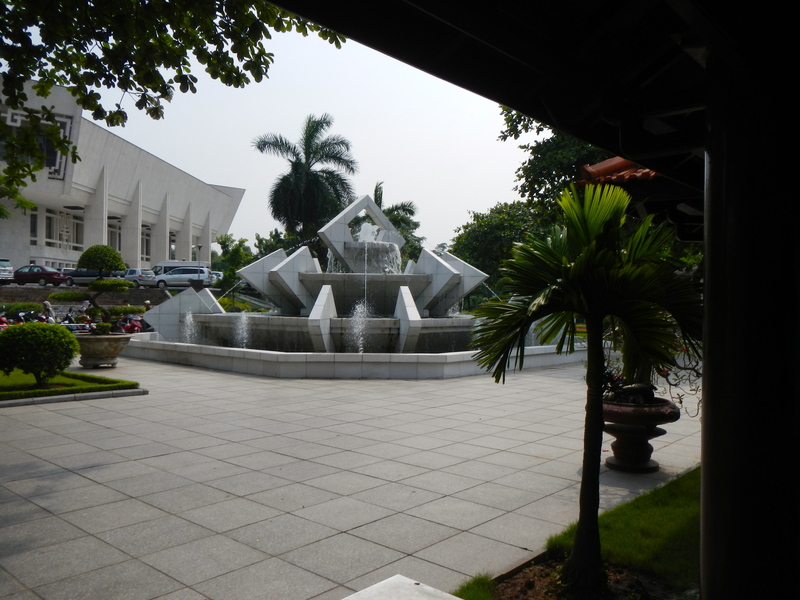 It was on a 35° Saturday morning that we decided to head out to Ho Chi Minh‘s Mausoleum and museum. We had hired a guide, provided free by an english club in Hanoi through a tour agency. But like the cost, he/she never showed up. So we set off on our own in a little green matchbox taxi, in air conditioned comfort. Ho Chi Minh is known to the Vietnamese as “Uncle Ho”. He was the faciltator and hero of Vietnam during both the French, Japanese and American occupation. A highly intelligent man, he was vital to the success of the Vietnamese in obtaining independence from Foreign Oppression. His beautiful poetry and written wisdom continue to inspire and guide Vietnamese and international vistiors alike. Ho Chi Minh’s body is housed in a masouleum in Hanoi. A tall dark building, it looms over a large free area of vibrant green grass. It is open Tues – Thurs and Sat – Sun from 7.30am – 11am and then from 1pm – 2pm. We made the mistake of visiting on a Saturday morning and were greeted with a line about a kilometre long. The sun beat down on us as we crawled along, attempting to maintain our position in line. I couldn’t believe it when a woman pushed Craig out of the way and made her way 100 metres ahead of us. We stared at her in disbelief, then we decided to have some fun. Like the wall of people at the front of a concert, Craig and I blocked the aggressive Ho Chi Minh seekers, by occupying twice the amount of space. After a long, very hot wait we entered the mausoleum, a wave of ice cold air blew enticingly out of the entrance. We sighed with relief. The body of Ho Chi Minh is stored in a glass casket and thousands of Vietnamese and international visitors come to view it every day. Unlike the line, the procession past the casket was both orderly and very fast. We were out in less than 6 minutes. In the same grounds there is the Ho Chi Minh Museum and One Pillar Pagoda. The One Pillar Pagoda was built in 1049, after the King of Vietnam had a dream. The pagoda is a realisation of this dream, as it was designed based on what the King described. Hoardes of tourists and opportunistic photographers crowded around this Pagoda. Set under the shade of tall trees, we took a moment to admire the longevity of the pagoda. Then it was off again, on the hunt for air conditioning and history. The Ho Chi Minh Museum was designed to look like a white Lotus flower. It houses over 200 documents relating to Ho Chi Minh’s life and work. The top level provides an insight into his soul, a collection has been curated which shows visitors the inspiration behind Ho Chi Minh’s war efforts, poetry and education. Picasso’s Guernica features, as well as numerous art works and exhibits that tell the story of war. The lower level, is written mainly in Vietnamese but shows the impact that Minh has continued to have, with displays of news articles, video and photographs. What struck me, was the passion and love that the locals showed for their Uncle Ho. Small children and their parents rush to take photos with a gold statue replica, and children flock to a photo on the wall where they can pretend to hold Uncle Ho’s hand. The museum was more popular for the locals than tourists. An air conditioned taxi ride, hailed from the street, not from the numerous vendors offering you one for “very cheap, Mr” whisked us home to the hotel. Tomorrow it is time to say Tạm biệt to Vietnam and Sawadee Ka to Phuket.